Pianist Vera Danchenko-Stern feels that combining music and poetry in the classic style of the Romance allows listeners to understand an entire culture even without knowing the language. Ask any American to name a piece of music by a Russian composer, and you’ll likely hear them mention Tchaikovsky’s “The Nutcracker” or “Swan Lake,” or perhaps Prokofiev or Shostakovich. They’d likely describe the music as grand, emotional and often dramatic. But there is a softer, less-known genre of Russian music that weaves together voice, music and poetry. This distinct fusing of artistic styles is called the Romance. Originating in the late 18th century, the genre combines lyrical Russian poetry with the sounds of traditional Slavic folk music. Composer Mikhail Glinka (1804-1857) is credited with bringing the Romance into the houses of Russian nobility and subsequently making it a national art form. The Romance came to Washington, D.C., 10 years ago when Vera Danchenko-Stern, a Moscow native who graduated from the Gnessin Institute of Music in Moscow with honors in piano, solo performance, chamber music, vocal and instrumental accompaniment, founded the Russian Chamber Arts Society (RCAS). Danchenko-Stern, who moved to D.C. in 1990, has been responsible for all of RCAS’s programming. The upcoming 2015-2016 concert season will celebrate a decade of performing Romances for American audiences. The genre of the Romance is poignant and heartfelt; the poetry takes on a new meaning when set to music. Danchenko-Stern estimates that a surprising 95 percent of her audience is typically American, with the remainder being Russian. Danchenko-Stern feels that combining music and poetry in the classic style of the Romance allows listeners to understand an entire culture even without knowing the language. The Russian Chamber Arts Society will celebrate its 10th anniversary with a special gala concert Oct. 2 at the Embassy of Austria in D.C.
“My goal is to expose the audience to pieces that they may not have heard before,” says Danchenko-Stern. Performances are hosted at the Austrian Embassy, whose acoustics work well for chamber singing, she says. One energetic piece to be performed in October, “I Remember the Wonderful Moment” with music by Mikhail Glinka and lyrics by Alexander Pushkin, is sung by a tenor who tells of falling in love at first sight, only to fall into deep despair “in the gloom of captivity” until his beloved appears again. “In the Midst of the Ball,” with music by Pyotr Ilich Tchaikovsky and lyrics by Count Aleksei Tolstoy, also tells of love from afar: A man spots a beautiful woman across the room at a ball and is captivated by her. The music matches the mystery, sadness and longing of the poetry. Danchenko-Stern has worked with vocalists singing Russian music for decades, including teaching voice (Singing in Russian) at the Johns Hopkins Peabody Institute. 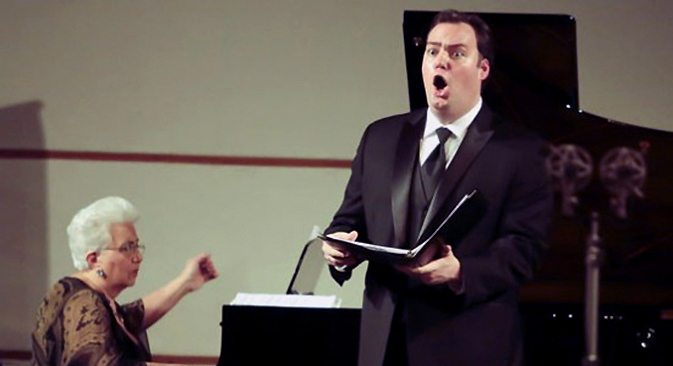 Many musicians and vocalists who perform with the RCAS are American. Several, such as Timothy Mix, are Danchenko-Stern’s former students that have gone on to international music careers. The Russian Chamber Art Society has also created an opportunity for exchange between Russian and American student musicians. As part of the 2008 season, RCAS organized a concert for the winners of the Three Centuries of Classical Romance Competition in St. Petersburg, Russia. In addition, American students from the Peabody Conservatory of Johns Hopkins University, Howard University, and Morgan State University have visited Moscow and St. Petersburg several times to take part in the International Festival Week of the Conservatories.